Posted: November 19th, 2008 under DX, Hamradio, Soundclips. XW1B was on 40M with a BIG signal on Saturday. He just put up his new MonstrIR. I didn’t work him on 40M. I have the country, and he was running North-America. I made a soundclip of him. VP9KF gave me a new country on 20M (#268). Other DX worked was N5WBF in NM on 30M and W6PU in NM on 40M. A new state on both bands. 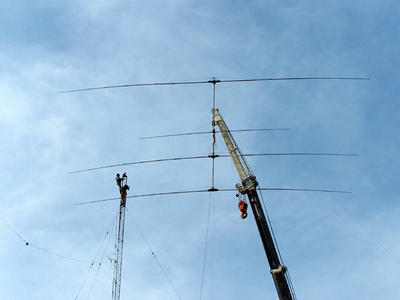 W6PU is running a 10 element wire yagi fixed to EU. WH2D was worked on 40M. Mike K3UOC is stationed in Guam now. I worked him many times as 7Z5OO several years ago. On Sunday I worked XW1B with a nice signal on 30M (#228 30M). Later in the evening on Sunday, Nelson 4S7NE was on 30M. He was easily workable and yet another new one on 30M (#229 30M).